Provide comfort for the family of Eugenia d'Elia with a meaningful gesture of sympathy. 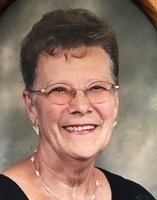 d’Elia, Eugenia “Jeanne” T. - 91 of Northfield, passed away on Saturday, April 13, 2019. Jeanne was born to Eugene and Rose DeMeo on August 12, 1927 in Ventnor and attended school in Atlantic City. She previously worked at McCarthy Ford Inc. and as a secretary for the Atlantic County Public Health Department. Jeanne was a founding member of St. Bernadette’s Church in Northfield where she served as a CCD instructor and was a member of the St. Bernadette Sodality. She was also a past member of the Pleasantville Ladies’ Kiwanis Club, Sinawik. Jeanne was well known for her hobbies of sewing, knitting, and crocheting, as well as crafting projects. Jeanne is predeceased by her husband of 65 years, Tom d’Elia, whom she met while working at Boardwalk National Bank after high school. She is also predeceased by her parents; her sister, Evelyn DeMeo of Atlantic City; and her grandson, Nicholas Albrecht of Somers Point. Jeanne is survived by her daughters, Lynda Thomas of West Atlantic City and Jeanne Albrecht of Somers Point; her son, Tom (Tara) d’Elia of Morris Plains, NJ; her grandchildren, Erin (Tim Boyer) Albrecht of Galloway and Ryan Albrecht of Somers Point; her great-grandson, Miles Nicholas Boyer of Galloway, whom she adored visiting with for the past 13 months and always brought a smile to her face; and her sister, Rosemary Kelly of Brigantine. Jeanne’s family would like to extend a special thank you to her aide, Judy, who was a great help to her as well as a good friend. A Mass of Christian Burial will be held on Wednesday, April 17th at 11:00am at St. Gianna Beretta Molla Parish, 1421 New Road, Northfield. A viewing will be held from 10:00am until the time of Mass. Burial will follow in Atlantic City Cemetery, Pleasantville. In lieu of flowers, contributions may be made in Jeanne’s memory to St. Jude Children’s Research Hospital through their website, www.stjude.org, or by mail at P.O. Box 1000, Dept 142, Memphis, TN 38148-0142. We encourage you to share your most beloved memories of Eugenia here, so that the family and other loved ones can always see it. You can upload cherished photographs, or share your favorite stories, and can even comment on those shared by others.